Cricket is said to be a batsman’s game. Bowling is a difficult task with the new rules favouring the batsmen. Even there are some bowlers who dominated the game equally as the batsmen do. But there are few who excelled in both the departments. The All Rounder role plays a vital part in a team’s success. Cricmatez.com brings you the Top 10 Greatest All Rounders of All Time in the history of cricket. Shakib Al Hasan is ranked 10th in our list of top 10 greatest All Rounders of all time. Shakib is a left hand batsman and a slow left arm orthodox bowler who plays for Bangladesh. Since making his debut in 2006, Shakib is considered as the man for taking the Bangladeshi cricket in the right direction. At the moment he is the no.1 All-Rounder in all the formats. 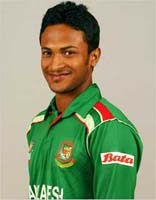 He was also given the captaincy at the tender age of 22 and led Bangladesh to their first ever series win overseas. Shakib nicknamed “MOYNA” has scored over 5500 runs and picked up 265 wickets in a short span of 5 years and lot is expected from this 25 year old in the future. Surely the Bangladeshis are missing this man in the ongoing series in Sri Lanka. Sanath Teran Jayasuriya was the man who redefined the term opening in ODI’s. The tactic used was to attack the opening bowlers during the mandatory field restriction period by lofting their deliveries over the infielders. He has torn apart almost every bowler in his era. Actually he made his international debut for Sri Lanka as a Slow Left arm Orthodox bowler. He reduces the workloads of the Lankan strike bowlers Muralitharan and Vaas by containing the flow of runs and by taking wickets at crucial junctures. He was named the Player Of the Tournament during the 1996 World Cup. Jayasuriya, also called as “MATARA MAULER” has captured 421 International wickets and has scored nearly 20,500 runs in his career span of 22 year which made him no. 9 in our list of top 10 greatest All Rounders of all time. Ian Botham former England captain is given the eighth spot in our list of top 10 greatest All Rounders of all time. Botham nicknamed “BEEFY” made his debut for England in 1976 has been considered as the greatest ever All Rounder to have played for his country. He single handedly won England the 1981 Ashes series with his All Round performances which included 399 runs and 34 scalps. The series was later called as BOTHAM’S ASHES. He still holds the record for the highest number of Test wickets taken by an England player. In a career which spanned over 16 years, Botham has captured 528 wickets and has scored 7313 runs. He was given the Knighthood in 2007 and was also a part of ICC’s Hall Of Fame. After his retirement from cricket, Botham became a successful commentator. 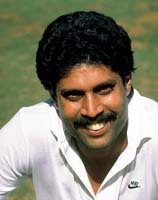 Kapil Dev was a right arm pace bowler and a right handed batsman who played for India between 1978 and 1994. He had the ability to swing the ball either ways and can bowl at a high pace which makes him the best Indian fast bowler till date. In his batting, he played with an aggressive intent often driving and pulling the ball to the fence. He is famous for NATRAJA SHOT that he used to play the pull shot with his left leg in the air which resembles Lord Natraj. He is one of the only players in the history of Test cricket to have taken more than 400 wickets and scored more than 5,000 runs. He also led India to their first World Cup victory in 1983. After his departure India are still in search of a genuine All Rounder. In his 16 year old career, he has scored runs and scalped wickets which makes him the number seven in our list of top 10 greatest All Rounders of all time. Also known as “HARYANA HURRICANE”, he was inducted into ICC’s Hall of Fame in 2010. 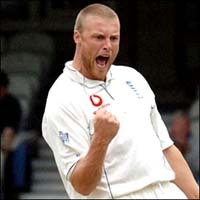 Number six in our list of top 10 greatest All Rounders of all time goes to former England captain Andrew Flintoff. Nicknamed “FREDDIE”, Flintoff is known for his All Round abilities. He bowls Right Arm Fast with which he had picked up395 wickets and bats right handed scoring 7239 runs in his 11 year old career. Like Ian Botham, Flintoff single handedly won the 2005 Ashes for England. His career was often jolted by injuries but still was consistently rated by the ICC as being among the top International All Rounders in both ODI and Test cricket during his time. Despite his injuries, he was considered as an integral member of the England team. He announced his retirement from International cricket after the victorious 2009 Ashes series. He was famous for removing his shirt off and waving it in the air after England beat India in an ODI in Mumbai. After his cricketing career, Flintoff tried his hand in Boxing and became a professional Boxer. Garfield Sobers is a former West Indian cricketer who played cricket between 1954 and 1974 is widely considered one of cricket’s greatest all-rounder of all time. In 1958, he created a record for the highest individual score in an innings, which was later broken by Lara. 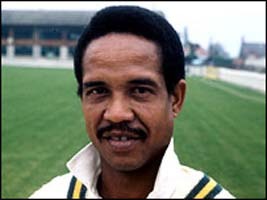 Nicknamed “GARRY”, Sobers was given the honourable Knighthood in 1975. Sobers became the first player ever to hit six sixes in a single over. As a bowler, he bowled Left Arm Medium and Slow Left Arm. He is considered as a Partnership breaker. With his All Round abilities, Sobers was an integral part of Rohan Kanhai’s West Indian team in early 1970’s which is considered as the beginning of their dominance. In a career which spanned over 20 years, Sobers has captured 236 wickets and has scored 8032 runs which makes him the number five in our list of top 10 greatest All Rounders of all time. Number four in our list of top 10 greatest All Rounders of all time goes to former Pakistan captain Imran Khan. Imran Khan is undoubtedly the greatest cricketer to play for Pakistan. He was a Right Handed batsman and a Right Arm Fast bowler. He was considered as Pakistan’s most successful cricket captain, leading his country to victory at the 1992 Cricket World Cup. He played for the Pakistani cricket team from 1971 to 1992. In his career of 20 years, he has scored 7516 runs and took 544 wickets. He was the one who groomed some legendary Pakistani cricketers such as Wasim Akram, Waqar Younis and Inzamam ul Haq. Even after his retirement, Imran Khan was selected to lead Pakistan for the 1992 World Cup due to the demand by the people . In the year 2010, Khan was inducted into the ICC Cricket Hall of Fame. After his retirement from cricket, Khan entered into Politics. Richard Hadlee is a Bowling All Rounder who played for New Zealand between 1973 and 1990. He is the best cricketer New Zealand has ever produced. He was a very intelligent bowler having great control and accuracy in his line and length. He is known as the SULTAN OF SWING AND CUTS. He was the first to claim 400 test wickets. Apart from the West Indian quicks, Hadlee was the most feared bowler during his time. His Batting was not as successful as his bowling. He had won many matches for the Black Caps with the bat. He was given the Knighthood in the year 1980. He has scored 4875 runs and scalped 589 wickets in his career which spanned for 17 years which makes him the number three in our list of top 10 greatest All Rounders of all time. 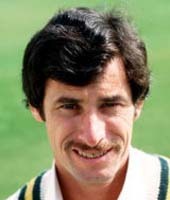 Hadlee along with Imran Khan and Kapil Dev was considered as the best All Rounder of his era. 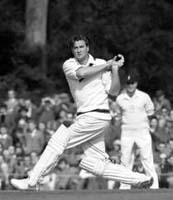 The Number two spot in our top 10 greatest All Rounders of all time is occupied by Late Keith Miller. At the time of his retirement from Test cricket, Miller had the best records among fellow All Rounders. He often batted high in the order at number three. He was a natural striker of the ball and was a powerful hitter as well. Miller was known for his technique to confuse the batsmen by varying his pace,line and length while bowling. He made full use of slower deliveries and bowls his fastest deliveries from a short run up. He was also an acrobatic catcher in the slips. Miller’s abilities as an all-rounder led to enormous success as both batsman and bowler. In his career which spanned just over ten years, Miller had scored 2958 runs and scalped 170 wickets. Jacques Kallis is a South African cricketer whose name can be added as the meaning for the word All Rounder in a Dictionary. In the history of cricket, he is the only player to score more than 11,000 runs and take 250 wickets in both one day and Tests. Nobody can ignore him in their list of top 10 greatest All Rounders of all time. He remains the major threat for Sachin’s records in tests. He is just seven short of Sachin’s 51 test centuries and 2400 behind the master in terms of total runs in tests. The fact that Kallis has played 34 matches less than Sachin makes the cricket Pundits to compare Kallis with Legendary Sachin. With his age not supporting him, he is still consistent in all departments across all formats. Still going strong after making his debut in 1995, Kallis has 24626 runs and took 558 wickets which makes him the number one in our list of top 10 Greatest All Rounders of all time. Previous articleWhy India can’t produce genuine fast bowlers?